Today, flooring choices are as important to your overall design as furniture and paint. Whether you use vinyl flooring, area rugs, wall-to-wall carpeting or marble, the choices are endless and the finished look is nothing short of spectacular. If possible, buy the rug first and make it your focal point, then dress the area with furniture. If space permits, the furniture should sit on the outskirts of the rug, not on top of it. 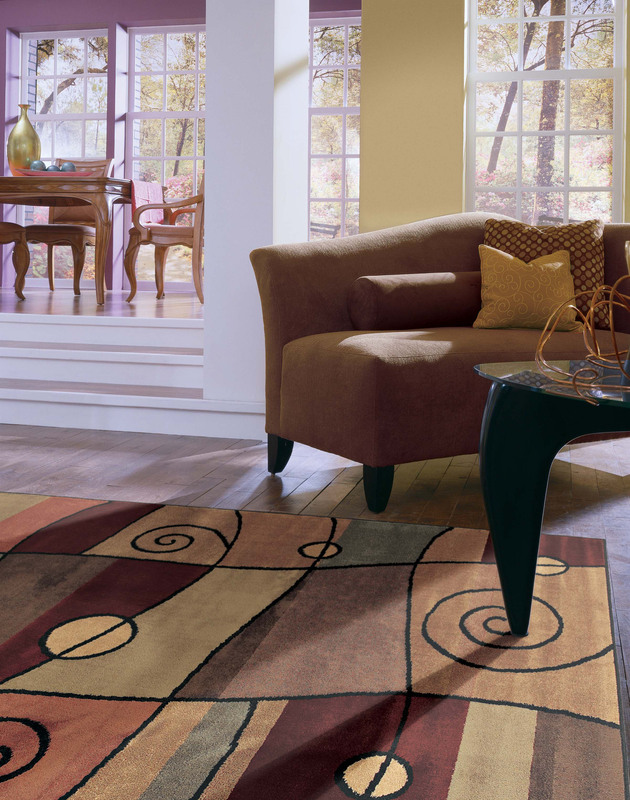 Rotate area rugs periodically to minimize the wear and tear to any one part. If furniture lies on the rug, try to occasionally move everything one or two inches in order to keep it from permanently crushing the carpet fibers and leaving depressions in the rug. Patterns can be sweet and delicate, or full of pizzazz. They can blend in or stand out. A large design can cut your room down to size, while a minimal pattern or solid colored carpet can make your room appear to grow in size. A bright floral design can make a room that doesn’t get much natural light, more welcoming than before. Patterns can also hide a multitude of sins, camouflaging the little spills and mishaps that come with life at home. Carpet has become one of the most versatile items in home decorating and has found its way into 95 percent of all households in America. Recent innovations have produced products that are more vibrant, stronger, and wear better than ever before. Wool and synthetic fiber carpets have become an affordable luxury that, with regular vacuuming and deep cleaning, can be the proud focal point of your home for many years. Consider these rug ideas for your living room design. Real Simple magazine also suggested patterned rugs to make the space more visually interesting, adding another element of texture to your living room. Use your rug as an accessory. The size of you rug should be smaller than the area that your furniture covers. People often make the mistake of using an oversized rug for their room, covering up more of their hardwood floor than they have to. According to HGTV, the front two legs of your sofas or chairs should be placed on the area rug, supporting the gathering space, but not taking away from the overall sleekness or openness of the room. Think of the rug as an accessory, just like your ottoman or coffee table. It shouldn’t take over your flooring, but complement it instead. “It is a nice way to add color to a room if you don’t want to commit to a strong color on the furnishings or window treatments,” designer Jennifer Duneier told HGTV. Real Simple recommended using a decorative rug to draw attention to a specific piece of furniture, like your bold-colored sofa. This is easily done by contrasting the color of the rug with that of the piece of furniture you want to make the focal point of the living room. Colors and designs for area rugs run the gamut from serene and subdued to spunky and bright. But don’t be confused about your selection. Here are a few guidelines. If you want to make a bold, contemporary statement, consider a large floral pattern or dazzling geometric that becomes the room’s main focal point. 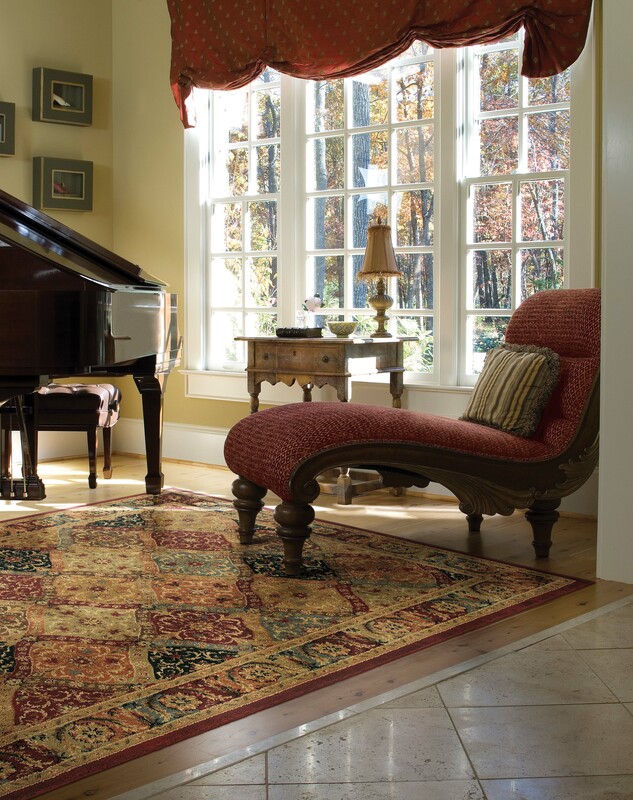 To add warmth, texture and quiet style, try a rug with more subdued colors or a classical pattern in subtle shades. Living Areas: A rug should be large enough to hold seating groups and small enough that the floor forms a contrasting frame around it. Dining Areas: Choose a rug large enough to accommodate chairs when they’re pushed away from the table. Foyers: The rug should cover a large portion of the area, allowing a generous 18- to 24-inch border of floor to frame it. Do you have a favorite area rug? Long before the term “wall-to-wall” was invented, area rugs graced the floors of human dwellings. The original area rugs may have been lion skins — and they may have done double duty as beds, but it was an area rug, just the same. Later on, our ancestors learned to weave rushes and grasses to make mats. Once we started domesticating sheep, we learned to spin their wool into yarns and weave them. Some time before 2000 BC, the nomadic tribes of Asia began making rugs in great numbers. The Mongols gave us pile rugs, but the Persians turned rug making into an art form. European rug weaving probably started about 1000 AD in Spain. Intrepid explorer Marco Polo influenced rug making with his discoveries of new materials and techniques in China in the late 1200s. As civilization has marched forward, there’s likely been a good rug underfoot. Area rugs are tremendously versatile. With the appropriate pad, area rugs work on any type of flooring and in any room. The results are magical. Area rugs offer unlimited combinations of color, texture, pattern and placement. They are the only flooring product that you can easily install, then pick up and move! Today’s area rugs are most often machine-made with sophisticated design patterns on computerized looms that can imitate the more intricate handmade rugs — but at greatly reduced costs. They are generally made out of wool, silk, (or a blend of wool/silk), olefin (polypropylene) or nylon —occasionally cotton, and even bamboo. Wool and silk antique and modern area rugs rule the high end of the market. 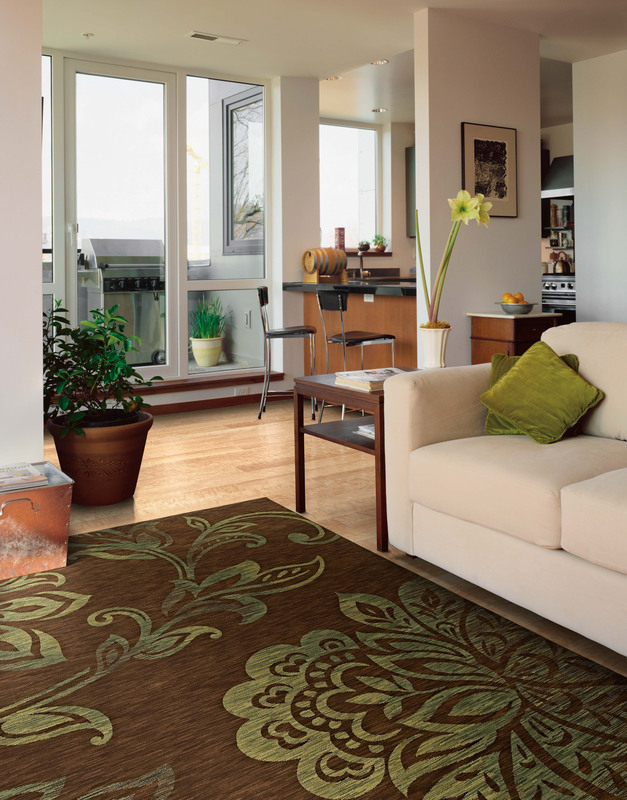 More moderately priced rugs are manufactured from heat-set olefin, which looks like wool and cleans easily. Are you looking for an investment, a family heirloom, a practical room addition or a fun accessory? Whatever your need or intention, you simply can’t go wrong with an area rug.